If you want to discover more museums and cute cafes in Paris that are off the beaten path, check out our Paris Museums Guide! The Louvre Museum, the world’s largest museum, can be incredibly intimidating when approaching its collection for the first time. While you will easily be able to locate the Mona Lisa, the other works of the art that are also extremely well known can be difficult to find even when given a Louvre Museum map. 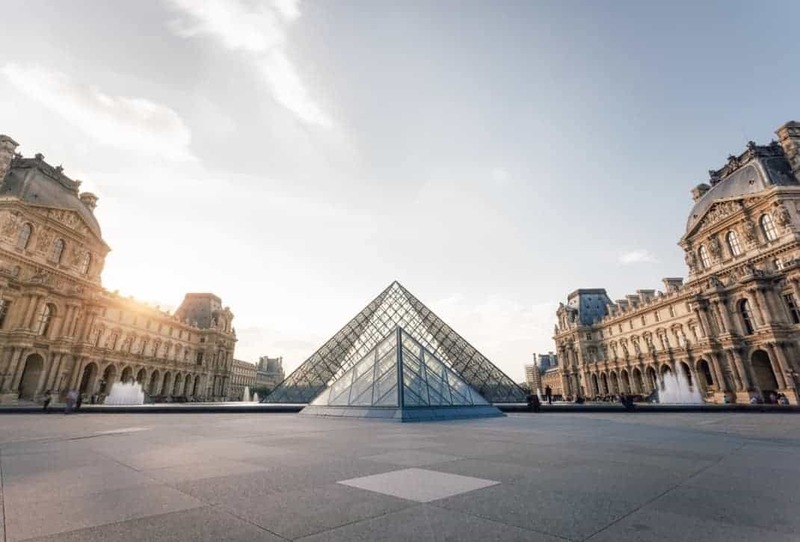 If you want to hit all of the main sights and even some hidden gems along the way in the Louvre Museum – all in one day – here is our detailed guide for you to follow. Keep reading to find out how to get Louvre Museum advance tickets, speedy Louvre Museum admission and the best time to visit the Louvre Museum. The Louvre Museum can be very simply entered through the Pyramid, which is the main entrance to the museum. However, lines here can be extremely long, even in the “Priority Access” line for visitors with advance tickets or member passes. A trick is to enter through the Carousel du Louvre, accessible from Rue de Rivoli or the metro “Palais Royal – Musée du Louvre” to enter even faster. Disabled visitors, however, can enter via the Pyramid entrance, without waiting in line. After entering the museum, you can buy tickets under the pyramid before entering any of the three wings. You can also buy tickets online or buy a Paris Museum Pass. The Louvre is closed on Tuesdays, so there will be slightly more people there on Wednesdays, and as always, on the weekends. The best time to visit is on Mondays and Thursdays, and on Wednesday and Friday evenings as of 6 pm until 10 pm, when there will be the least amount of visitors in the museum and you get the pleasure of being around the works with fewer people impairing your view! Also on Friday evenings at the Louvre, admission is free for everyone of all nationalities under age 26. Lastly, on the first Sunday of every month from October to March admission is free for all visitors. In the Denon wing of the Louvre Museum, you will find the most famous or popular works at the Louvre. If you only have time to do one wing, this is the one to visit but of course, it is highly recommended to go to all three. The Denon Wing is where the Grand Galerie is located, one of the most beautiful hallways of the Louvre that also houses the Louvre’s collection of Italian paintings, dating back to around the 13th century. Before entering the Grand Galerie, you will also pass by European sculptures on your way to the Winged Victory of Samothrace on the top of the Daru staircase. From here, you can enter the Grand Galerie to the right and then continue on until reaching the room where Leonardo Da Vinci’s Mona Lisa is located. This routing is the best way to see some of the greatest works of the Louvre. To visit later French paintings, you will have to pass the Mona Lisa and continue forward to see the Gericault and Delacroix massive paintings, including The Raft of the Medusa. INSIDR inside tip: Instead of turning right at the Winged Victory of Samothrace, turn left and enter the jaw-dropping Apollo Gallery! The Richelieu Wing is probably the least visited wing, but home to the stunning Napoleon Apartments that should definitely not be missed. There is also the great café Angelina right outside the Napoleon apartments, if you are needing a little coffee stop throughout your visit! In addition to the Napoleon apartments, in the Richelieu wing on the ground floor there are Near Eastern Antiquities, including the Law Code of Hammurabi. In this section, you will also have an excellent view overlooking the Cour Marly, a beautiful space filled with sculptures, most commissioned by Louis XIV. The Sully wing is where Egyptian, Greek, and Roman antiquities are largely located, including the Venus de Milo. The true gem of the Sully wing, however, is visiting the Medieval Louvre section where you can visit the ruins of the Louvre, to see how it formed when it was a fortress in the 12th century. Although there are no “artworks” here, learning about the history about the Louvre itself, remarkable in regards to its history and evolution from a fortress to a palace to one of the most remarkable museums in the world, is well worth the visit in itself.